The Future of Libraries - or Are They Already Dead? Have you heard these statements? What do you think? Are they true? More women than men used the library in the past 12 months (54% vs. 39%). College graduates are more likely to use the library than those whose education ended with a high school education. (56% vs. 40%). Parents are more likely than non-parents of minor children to have used the library in the earlier 12 months (54% vs.43%). So what are all these people doing at the library? *Local Fact: Last year, 115,461 people visited the Bastrop library; 43,310 individuals used the library’s computers or internet connection, and the busy reference staff answered 23,292 questions. What’s the most popular thing to do at the library? Make a guess, then check out the chart below to see if you’re right. We can see that checking out books is still the most popular activity. *Local Fact- In the fiscal year 2016-2017, patrons checked out 145,827 books and magazines. Many areas of our rural county are without high- speed internet that allows streaming of TV shows and movies, therefore DVDs are still popular items to check out here. In fact, residents here borrowed a whopping 18,782 DVDs last year! 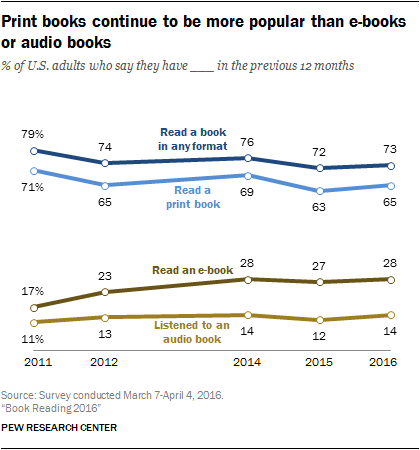 Moreover, according to the PEW Research Center, we can answer a resounding, “Yes!”, to the question of whether Americans are still reading books. Why Should I Care About the Library? Why are we discussing the value of libraries? One of the essential purposes of a Friends of the Library organization is for the members to be advocates for the library. An advocate (noun) is someone who supports a particular cause or policy. We all need to understand the value of the library, not just individually, but to our broader community. At a recent meeting, Bastrop County Judge Paul Pape shared an interesting fact. Did you know 80% of the county budget goes to law enforcement? It is by far the most significant item that our tax dollars support. In a future article, we will discuss the correlation between reading and education and the equally important link between academic success and criminal behavior. When we encourage reading, lifelong learning, and other library services, we are investing in lower crime rates and taxes - and in a better future for all! Newer PostWhat is a 3D Printer and Why Should I Care?